For other uses, see Hot sauce (disambiguation). Hot sauces come in many varieties. Hot sauce, also known as chili sauce or pepper sauce, is any condiment, seasoning, or salsa made from chili peppers and other ingredients. A very popular addition to different types of food, hot sauce allows individuals to enhance the flavor of their meals. Many commercial varieties of mass-produced chili sauce exist. Some commercially produced chili sauces are canned, with red tomato that is processed into a pulp used as the primary ingredient. The H. J. Heinz Company is one major producer of chili sauces. In the United States, commercially produced chili sauces are assigned various grades per their quality. These grades include U.S. Grade A (also known as U.S. Fancy), U.S. Grade C (also known as U.S. Standard) and Substandard. Criteria in food grading for chili sauces in the U.S. includes coloration, consistency, character, absence of defects and flavor. Humans have used chili peppers and other hot spices for thousands of years. Inhabitants of Mexico, Central America and South America had chili peppers more than 6,000 years ago. Within decades of contact with Spain and Portugal in the 16th century, the American plant was carried across Europe and into Africa and Asia, and altered through selective breeding. One of the first commercially available bottled hot sauces in America appeared in 1807 in Massachusetts. Few of the early brands from the 1800s survive to this day, however. Tabasco sauce is the earliest recognizable brand in the United States hot sauce industry, appearing in 1868. As of 2010, it was the number 13 best-selling seasoning in the United States preceded by Frank's RedHot Sauce in 12th place, which was the sauce first used to create buffalo wings. Many recipes for hot sauces exist, but the only common ingredient is some variety of chili pepper. Many hot sauces are made by using chili peppers as the base and can be as simple as adding salt and vinegar. Other sauces use some type of fruits or vegetables as the base and add the chili peppers to make them hot. Manufacturers use many different processes from aging in containers to pureeing and cooking the ingredients to achieve a desired flavor. Because of their ratings on the Scoville scale, Ghost pepper and Habanero peppers are used to make the hotter sauces but additional ingredients are used to add extra heat, such as pure capsaicin extract and mustard oil. Other common ingredients include vinegar and spices. Vinegar is used primarily as a natural preservative, but flavored vinegars can be used to alter the flavour. Belizean hot sauces are usually extremely hot and use habaneros, carrots, and onions as primary ingredients. Marie Sharp's is a popular brand of hot sauce produced in Dangriga. Traditional Panamanian hot sauce is usually made with "Aji Chombo", Scotch Bonnet peppers. Picante Chombo D'Elidas is a popular brand in Panama, with three major sauces. The yellow sauce, made with habanero and mustard, is the most distinctive. They also produce red and green varieties which are heavier on vinegar content and without mustard. Although the majority of Panamanian cuisine lacks in spice, D'Elidas is seen as an authentic Panamanian hot sauce usually serviced with Rice with Chicken or soups. Peru and Bolivian medium hot, frutal locoto sauces are popular. The most popular sauce is the Diaguitas brand, made of pure red (very hot) or yellow (hot) Chilean peppers mixed only with water and salt. Other hot sauces are made from puta madre, cacho de cabra, rocoto, oro and cristal peppers, mixed with various ingredients. Mild hot sauces include some "creamy style" (like ají crema), or a pebre-style sauce, from many local producers, varying in hotness and quality. Mexicans prefer to eat chili peppers chopped, but when making hot sauces they are typically focused more on flavor than on intense heat. Chipotles are a very popular ingredient of Mexican hot sauce and although the sauces are hot, the individual flavors of the peppers are more pronounced. Vinegar is used sparingly or not at all in Mexican sauces, but some particular styles are high in vinegar content similar to the American Louisiana-style sauces. Some hot sauces may include using the seeds from the popular achiote plant for coloring or a slight flavor additive. The process of adobos (marinade) has been used in the past as a preservative but now it is mainly used to enhance the flavor of the peppers and they rely more on the use of vinegar. Mexican-style sauces are primarily produced in Mexico but they are also produced internationally. The Spanish term for sauce is salsa, and in English-speaking countries usually refers to the often tomato-based, hot sauces typical of Mexican cuisine, particularly those used as dips. There are many types of salsa which usually vary throughout Latin America. These are some of the notable companies producing Mexican style hot sauce. The varieties of peppers that are used often are cayenne, chipotle, habanero and jalapeño. Some hot sauces, notably Tabasco sauce, are aged in wooden casks similar to the preparation of wine and fermented vinegar. Other ingredients, including fruits and vegetables such as raspberries, mangoes, carrots, and chayote squash are sometimes used to add flavor, mellow the heat of the chilis, and thicken the sauce's consistency. Artisan hot sauces are manufactured by smaller producers and private labels in the United States. Their products are produced in smaller quantities in a variety of flavors. Many sauces have a theme to catch consumers attention. A very mild chili sauce is produced by Heinz and other manufacturers, and is frequently found in cookbooks in the U.S. This style chili sauce is based on tomatoes, green and/or red bell peppers, and spices; and contains little chili pepper. This sauce is more akin to tomato ketchup and cocktail sauce than predominantly chili pepper-based sauces. Sriracha sauce, a type of Californian hot chili sauce manufactured by Huy Fong Foods, has become increasingly popular in the United States in contemporary times. Louisiana-style hot sauce contains red chili peppers (tabasco and/or cayenne are the most popular), vinegar and salt. Occasionally xanthan gum or other thickeners are used. Crystal Hot Sauce is a brand of Louisiana-style hot sauce produced by family-owned Baumer Foods since 1923. Tabasco sauce Earliest recognizable brand in the hot sauce industry, appearing in 1868. Trappey's Hot Sauce Company was founded in 1898 Chili pepper water, used primarily in Hawaii, is ideal for cooking. It is made from whole chilies, garlic, salt, and water. Often homemade, the pungent end product must be sealed carefully to prevent leakage. Sriracha sauce, a traditional Thai hot sauce, made primarily of ground chilies, garlic, vinegar, sugar, and salt. Often called "rooster sauce" after the most widely sold U.S. brand, Huy Fong Foods. New Mexican style chile sauces differ from others in that they contain no vinegar. Almost every traditional New Mexican dish is served with red or green chile sauce. The sauce is often added to meats, eggs, vegetables, breads, and some dishes are, in fact, mostly chile sauce with a modest addition of pork, beef, or beans. Green chile: This sauce is prepared from any fire roasted native green chile peppers, Hatch, Santa Fe, Albuquerque Tortilla Company, Bueno and Big Jim are common varieties. The skins are removed and peppers diced. Onions are fried in lard and a roux is prepared. Broth and chile peppers are added to the roux and thickened. Its consistency is similar to gravy, and it is used as such. It also is used as a salsa. Red chile: A roux is made from lard and flour. The dried ground pods of native red chiles are added. Water is added and the sauce is thickened. Hot pepper sauces, as they are most commonly known there, feature heavily in Caribbean cuisine like Caribbean style Bacchanal Pepper Sauce. They are prepared from chilli peppers and vinegar, with fruits and vegetables added for extra flavor. The most common peppers used are habanero and Scotch bonnet, the latter being the most common in Jamaica. Both are very hot peppers, making for strong sauces. Over the years, each island developed its own distinctive recipes, and home-made sauces are still common. Trinidad Scorpion is considered one of the hottest and most frutal families of strains, and is cultivated and hybridized in the United States, United Kingdom, Australia and elsewhere. Bajan pepper sauce, a mustard and Scotch bonnet pepper based hot sauce. Sofrito - small piquins ("bird peppers") with annatto seeds, coriander leaves, onions, garlic, and tomatoes Pique sauce is a Puerto Rican hot sauce made by steeping hot peppers in vinegar. Don Ricardo Original Pique Sauce, which is made with pineapple, is a Puerto Rican staple. Don Ricardo originated in Utuado (Spanish pronunciation: [uˈtwaðo]) a municipality of Puerto Rico located in the central mountainous region of the island known as La Cordillera Central. Scotch bonnets are the most popular peppers used on Jamaica. Pickapeppa sauce is a Jamaican sauce. Sriracha sauce is a Thai chili sauce, originally from the town of Si Racha, Thailand. Vietnamese hot sauce is made from sun-ripened chili peppers, vinegar, garlic, sugar and salt. It is very popular in Vietnamese cuisine, often used in a wide variety of foods. Peri Peri sauce is a style of piri piri chili sauce used by Nando's Chicken fast food restaurants. Nali Sauce is a style of piri piri chili sauce. Piri piri is the popular chili sauce; the term "piri piri" came to English through the Portuguese language through contact with Portuguese Mozambique. The Pacific Islands are influenced by Asian and European cuisines. Hot chili sauce is a thick Chinese style sauce. Sweet chili sauce is a Thai style sweet dipping sauce. Peri Peri sauce is a Portuguese style piri piri sauce. 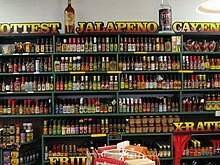 The availability of a wide variety of hot sauces is a relatively recent event in Australia (with little more than the flagship Tabasco cayenne variety and thick, medium hot Indochinese sauces widely available last century), although very faithful locally produced versions of habanero and Trinidad Scorpion sauces are now available. Sweet chili sauce - a Thai style sweet dipping sauce (debatable as to whether this can be called a hot sauce). Peri Peri sauce is a Portuguese style piri piri sauce that is also common in South Africa. Chinese style sauces such as black bean and chili. The heat, or burning sensation, experienced when consuming hot sauce is caused by capsaicin and related capsaicinoids. The burning sensation is not "real" in the sense of damage being wrought on tissues. The mechanism of action is instead a chemical interaction with the neurological system. The seemingly subjective perceived heat of hot sauces can be measured by the Scoville scale. The Scoville scale number indicates how many times something must be diluted with an equal volume of water until people can no longer feel any sensation from the capsaicin. The hottest hot sauce scientifically possible is one rated at 16,000,000 Scoville units, which is pure capsaicin. An example of a hot sauce marketed as achieving this level of heat is Blair's 16 Million Reserve (due to production variances, it is up to 16 million Scoville units), marketed by Blair's Sauces and Snacks. By comparison, Tabasco sauce is rated between 2,500 and 5,000 Scoville units (batches vary) - with one of the mildest commercially available condiments, Cackalacky Classic Condiment Company's Spice Sauce, weighing in at less than 1000 Scoville units on the standard heat scale. A general way to estimate the heat of a sauce is to look at the ingredients list. Sauces tend to vary in heat based on the kind of peppers used, and the further down the list, the less the amount of pepper. Cayenne - Sauces made with cayenne, including most of the Louisiana-style sauces, are usually hotter than jalapeño, but milder than other sauces. Chile de árbol - A thin and potent Mexican chili pepper also known as bird's beak chile and rat's tail chile. Their heat index uses to be between 15,000 and 30,000 Scoville units, but it can reach over 100,000 units. In cooking substitutions, the Chile de árbol pepper can be traded with Cayenne pepper. Habanero - Habanero pepper sauces were known as the hottest natural pepper sauces, but nowadays species like Bhut jolokia, Naga jolokia or Trinidad Scorpion Moruga are even five or ten-fold hotter. Jalapeño - These sauces include green and red jalapeño chilis, and chipotle (ripened and smoked). Green jalapeño and chipotle are usually the mildest sauces available. Red jalapeño sauce is generally hotter. Naga Bhut Jolokia - The pepper is also known as Bhut Jolokia, ghost pepper, ghost chili pepper, red naga chilli, and ghost chilli. In 2007, Guinness World Records certified that the Ghost Pepper (Bhut Jolokia) was the world's hottest chili pepper, 400 times hotter than Tabasco sauce; however, in 2011 it has since been superseded by the Trinidad Moruga Scorpion. Piri piri - The Peri Peri pepper has been naturalized into South Africa and is also known as the African Bird's Eye pepper, Piri-Piri pepper or Pili-Pili pepper, depending on what area of the country you’re in. The pepper ranges from one half to one inch in length and tapers at a blunt point. The small package packs a mighty punch with a 175,000 rating on the Scoville scale, near the Habanero, but the Peri Peri is smaller and has a much different flavor. It is most commonly used in a hot sauce, combined with other spices and seasonings because it has a very light, fresh citrus-herbal flavor that blends well with the flavors of most other ingredients. Scotch Bonnet - Similar in heat to the Habanero are these peppers popular in the Caribbean. Often found in Jamaican hot sauces. Tabasco peppers - Sauces made with tabasco peppers are generally hotter than cayenne pepper sauces. Along with Tabasco, a number of sauces are made using tabasco peppers. Trinidad Moruga Scorpion The golf ball-sized chili pepper has a tender fruit-like flavor. According to the New Mexico State University Chile Institute, the Trinidad Scorpion Moruga Blend ranks as high as 2,009,231 SHU on the Scoville scale. Carolina Reaper - The Carolina Reaper® is a super hot pepper which has been described as a roasted sweetness delivering an instant level of heat. Developed by Puckerbutt Founder Ed Currie in Rock Hill, South Carolina, the Carolina Reaper averages over 1.5 million SHU and was awarded the Guinness World Record in November of 2013. Capsaicin extract - The hottest sauces are made from capsaicin extract. These range from extremely hot pepper sauce blends to pure capsaicin extracts. These sauces are extremely hot and should be considered with caution by those not used to fiery foods. Many are too hot to consume more than a drop or two in a pot of food. These novelty sauces are typically only sold by specialty retailers and are usually more expensive. Other ingredients - heat is also affected by other ingredients. Mustard oil and wasabi can be added to increase the sensation of heat but generally, more ingredients in a sauce dilute the effect of the chilis, resulting in a milder flavor. Many sauces contain tomatoes, carrots, onions, garlic or other vegetables and seasonings. Vinegar or lemon juice are also common ingredients in many hot sauces because their acidity will help keep the sauce from oxidizing, thus acting as a preservative. Capsaicinoids are the chemicals responsible for the "hot" taste of chili peppers. They are fat soluble and therefore water will be of no assistance when countering the burn. The most effective way to relieve the burning sensation is with dairy products, such as milk and yogurt. A protein called casein occurs in dairy products which binds to the capsaicin, effectively making it less available to "burn" the mouth, and the milk fat helps keep it in suspension. Rice is also useful for mitigating the impact, especially when it is included with a mouthful of the hot food. These foods are typically included in the cuisine of cultures that specialise in the use of chilis. Mechanical stimulation of the mouth by chewing food will also partially mask the pain sensation. Sambal, sauce typically made from a variety of chili peppers. Jerk spice, a marinade of spices and hot peppers commonly used in Jamaican cuisine. ^ Handbook of Vegetable Preservation and Processing. pp. 162–164. ^ a b c Tomato Production, Processing and Technology, WA Gould. pp. 460–462. ^ Brown, David (February 16, 2007). "One Hot Archaeological Find". The Washington Post. Archived from the original on October 16, 2017. ^ Thompson, Jennifer Trainer (2012-04-24). Hot Sauce!. North Adams, MA: Storey Pub. p. 15. ISBN 978-1-60342-813-2. ^ "The Best-Selling Condiments in the U.S.: No. 13 Best-Selling Condiment: McIllhenny Tabasco Sauce". BusinessWeek. Archived from the original on 2013-04-28. Retrieved 2013-04-14. ^ "The Best-Selling Condiments in the U.S.: No. 12 Best-Selling Condiment: Frank's RedHot Sauce". BusinessWeek. Archived from the original on 2013-04-07. Retrieved 2013-04-14. ^ Chili History and Hot Sauce. Archived from the original on 2016-10-12. ^ Tate, Nate; Tate, Mary Kate (2011-09-20). Feeding the Dragon: A Culinary Travelogue Through China with Recipes. ISBN 9781449408480. ^ Rombauer, I: Joy of Cooking, p. 847. Bobbs-Merrill, 1975. ^ Edge, John T. (May 19, 2009). "A Chili Sauce to Crow About". The New York Times. Retrieved 9 August 2014. ^ "Slash Food Article on Chili Pepper Water". Archived from the original on March 4, 2013. ^ "Reggae Reggae lies! Sauce millionaire Levi Roots admits 'I lied on Dragons' Den - it wasn't my grandmother's recipe'". dailymail.co.uk. Archived from the original on 2012-08-01. ^ "Whats 4 Eats recipe for Sos Ti-Malice". Archived from the original on 2012-12-01. ^ "Hottest chili". Guinnessworldrecords.com. 2011-03-01. Archived from the original on 2011-09-03. Retrieved 2013-03-02. ^ Fire Foods. "Hot Chilli Sauce Online | Hot Chili Sauce UK | Hottest Chilli Products". Firefoods.co.uk. Archived from the original on 2013-01-29. Retrieved 2013-03-02. ^ "''Ghost Chili'' Scares Off Elephants". News.nationalgeographic.com. Archived from the original on 2010-03-29. Retrieved 2010-04-11. ^ "Peri-Peri Peppers". Archived from the original on 2014-02-03. ^ "Does Hot Sauce Go Bad?". Archived from the original on 2015-04-02. Retrieved 2015-03-10. ^ Nasrawi, Christina Wu; Pangborn, Rose Marie (April 1990). "Temporal effectiveness of mouth-rinsing on capsaicin mouth-burn". Physiology & Behavior. 47 (4): 617–623. doi:10.1016/0031-9384(90)90067-E. PMID 2385629.